From 26 to 28 November 2018, the World Bank Group partnered with the Government of Côte d’Ivoire to host the ninth Ease of Doing Business Initiative conference. 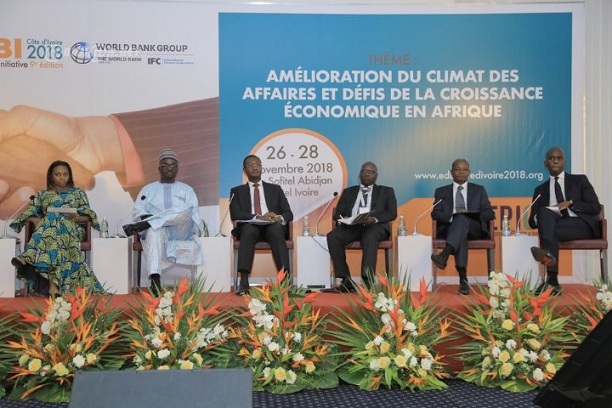 The conference, whose theme was “Improving the business climate and economic growth challenges in Africa”, gathered reform experts and policy makers to share best practice on Doing Business reforms. It was the first time the EDBI was hosted in West Africa and in a francophone country. What is the EDBI conference? The World Bank Group’s Advisory programs started supporting the EDBI conference to facilitate the promotion of good practice from the region in implementing business-friendly reforms measured by the Doing Business report. The first conference took place in Port Luis, Mauritius and gathered six countries. The initiative has become a continental learning platform, gathering participants from 32 Sub-Saharan countries at the conference in Abidjan. Rwanda will host the next EDBI conference in 2019. Delegates discussed how to integrate identification and implementation of business-friendly reforms in governments’ development plans, how to better measure private sector’s perception of the reform agendas through more efficient monitoring tools and how to better reflect private sector’s voice in the reform process. They also stressed on the need to encourage alternative solutions to SME financing, notably through solutions like venture capital and business angels. Sérgio Pimenta, IFC’s Vice-President for Middle-East and Africa: “Conducive business environments are important for IFC to deliver its strategy in Africa. Reforms measured by Doing Business help create the conditions for IFC to invest and mobilize more private capital to address development challenges. That is why our Advisory programs work with governments in Africa to sustain their reform momentum”. Sub-Saharan Africa’s performance in the Doing Business report has been steadily improving. In the Doing Business 2019 report, the region claimed 107 of the 314 reforms implemented worldwide, making it the most reforming region in the world. 40 out of the region’s 48 economies passed at least one reform improving their business environment, and four Sub-Saharan countries – Côte d’Ivoire, Kenya, Rwanda and Togo- were listed among the Top 10 global reformers.